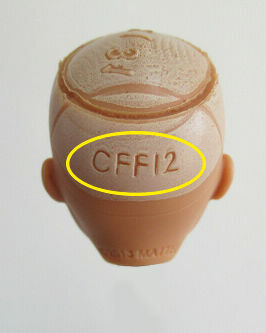 Several manufacturers put codes on doll heads for identification purposes. This page lists all Cy Girl and Barbie head sculpt codes I know of. 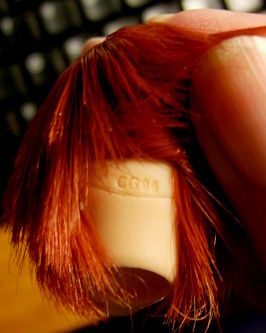 With CG heads there is a code molded in the nap of the neck, usually just above the hairline. Some of the names of the figures are linked to pages on my site. With Barbie heads there is a code molded on the back of the head, hidden underneath the hair. Some of these codes are handwritten and rather large (as on the picture), some are printed and can be quite small. There often is another code molded on the top of the head, this looks like some production code as it appears to differ between batches of the same head. Then there is also the copyright notice molded on the back edge of the neck. Some codes of familiar heads on more recent dolls appear to have a revision code added ("-1"). Also interesting is the new code for the "modified Carnaval" head, apparently Mattel considers this a new sculpt rather than a revision of the earlier Carnaval sculpt. This list of codes is still very incomplete as trying to find a code will mess up the hairdo and on top of that older Barbie heads and those of Collectors Barbies are more densely rooted, which makes finding and reading a code even harder. I've added the copyright year as molded on the edge of the neck and catalog numbers of the dolls I have checked. Some of the catalog numbers are linked to my B-Girls pages or to a picture. 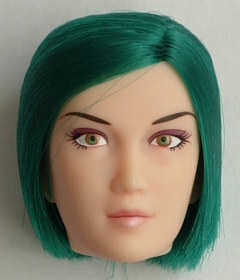 The face names are linked to illustrated discriptions on Kattis Dolls site, the best online reference for Barbie dolls.